Project Qatar ... well attended. The 2015 exhibition, held under the patronage of Sheikh Abdullah bin Nasser bin Khalifa Al Thani, Qatar’s Prime Minister and Minister of Interior, hosted 1,130 exhibitors from 40 countries across 21 pavilions; 2,000 leading firms and brands were represented this year across 41,500 sq m of indoor and outdoor exhibition space. 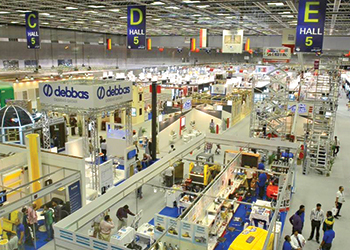 Over the course of four days, the exhibition featured a wide range of activities, including new workshops, site tours of major local construction projects, specialised conferences and the two concurrent events Heavy Max 2015, the 12th international exhibition for heavy machinery, and Qatar Stone Tech 2015, the fourth international stone and stone technology show. Moreover, the Project Qatar Business Intelligence Series will resume post-show, with three more conference to be held throughout the remainder of this year. Building on 11 years of history, Project Qatar has become the largest construction exhibition in the country, and remains a gateway to the region, said IFP Qatar, the organiser. Having attracted a wide variety of exhibitors and visitors from across the world, the event showcased state-of-the-art technology and provided insight into industry trends this year. Project Qatar’s enhanced B2B matchmaking platform, which featured 830 pre-arranged meetings, enabled visitors to interact with companies, share best practices, explore the latest technology, and pursue business deals, said the organiser. Project Qatar Workshop Series, which made its debut in this edition, brought about awareness on the commercial and educational aspects of the sector. Eight successful workshops covered an extensive array of topics, including issues confronting construction companies from a banking perspective, industry developments and opportunities as well as the transition toward PAS 99 Integrated Management Systems. International exhibitors had an opportunity to assess insights gained through these and other activities firsthand through a number of site visits, said the organiser. Delegations of 40 exhibitors each toured the Hamad New Port Project (HNPP), the Mall of Qatar construction site as well as Lusail City, all of which are among the largest infrastructure projects the sector currently features. The Project Qatar Business Intelligence Series, which is held during Project Qatar and throughout the year, will resume with three more conferences this year: Future Interiors Qatar (September 7 to 8), Future Landscape & Public Realm Qatar (October 26 and 27) and Future Drainage Networks Qatar (December 7 and 8). The topics these specialised conferences will address, respectively, are interior design and construction, sustainable and attractive outdoor environments as well as effective sewage and drainage networks. Project Qatar will be back for its 13th edition from May 2 to 5, 2016.